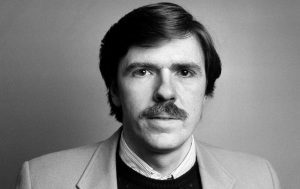 The media watch group FAIR writes: “Journalism lost one of its most valuable investigators when Robert Parry died from pancreatic cancer on January 27, at the age of 68. He was the first reporter to reveal Oliver North’s operation in the White House basement (AP, 6/10/1985), and the co-author of the first report on Contra drug-smuggling (AP, 12/21/1985). He did some of the most important work investigating the 1980 Reagan campaign’s efforts to delay the return of U.S. hostages held in Iran, a scandal known as the October Surprise. See also New York Times obituary. Nat Parry co-authored Neck Deep: The Disastrous Presidency of George W. Bush with Bob Parry and is one of his sons. He will be leaving the U.S. on Tuesday for Denmark, where he is based. He recently wrote a widely circulated overview piece on his father’s work, including how journalist Gary Webb (who committed suicide) built on Bob Parry’s work on Contra cocaine and was harshly attacked by establishment media; the Obama era and “Political Realignment and the New McCarthyism.” Nat appeared on the radio program “Flashpoints” Monday night with journalists Dennis Bernstein and John Pilger (who presented Bob with the Martha Gellhorn Prize for Journalism last year). The program was devoted to Bob’s work. This in-depth interview with Mark Ames from 2017 includes a description of how Parry dug up parts of the Iran-Contra scandal, including by playing different factions of the Contras against each other. Parry also talks about the necessity of funding truly independent media outlets. Parry’s books include Fooling America: How Washington Insiders Twist the Truth and Manufacture the Conventional Wisdom, Trick or Treason: The 1980 October Surprise Mystery and America’s Stolen Narrative: From Washington and Madison to Nixon, Reagan and the Bushes to Obama.